Publisher – The Binary Mill / NextGen Reality Pty. Arcade simulations are typically great fun, not quite capturing what the real-world activities would entail, but emulating them enough to give us a taste of the action. Rush is just that with you racing to the bottom of a mountain in a wing suit while competing with AI and human opponents. If the idea of skirting cliff sides and dodging trees on snow capped peaks or canyons sounds like a thrill to you then I’m betting Rush may just be what you are looking for. I’m not going to cover all the individual control methods available because there is plenty. You can use the Moves or DS4 with multiple options like tracking the position of the controllers or how you tilt them, or you can just use head tracking or a combination of a controller and head tracking. After trying them all out I will recommend the stock Motion controller option which has you holding out your hands as if you were Superman. You can adjust inversion settings but basically you fly by tilting your hands up or down to go up or down and tilting your hands left or right in the direction you want to go. The only downside to this mode is that your arms get tired but take a small break in between rounds and you should be fine. I urge you to try them all out yourself and see which may be more to your liking and regardless of how terrible I am with some of those methods, I still appreciate the option none the less. There are also some other comfort options available as well, so you may be a little sensitive to sim-sickness, you can do your best to circumvent that. 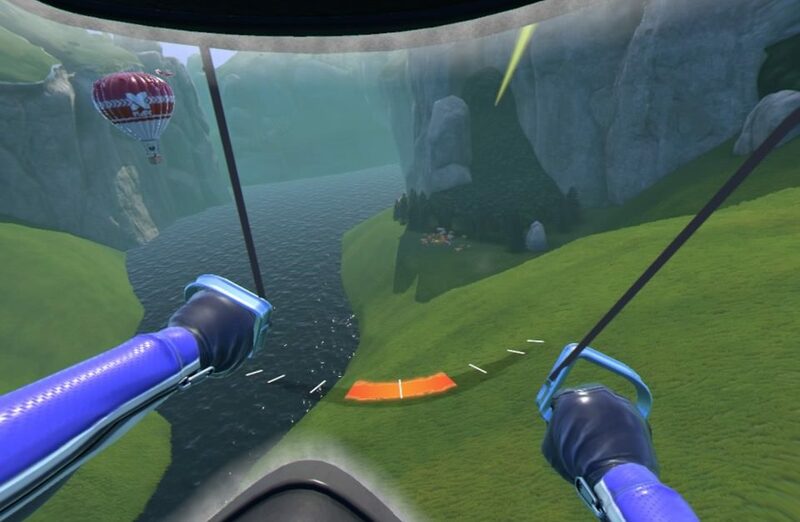 Regardless of which method you pick the game mechanics remain the same…fly through rings or ride close to the ground or cliff sides to maximize that boost and finish in 1st place. 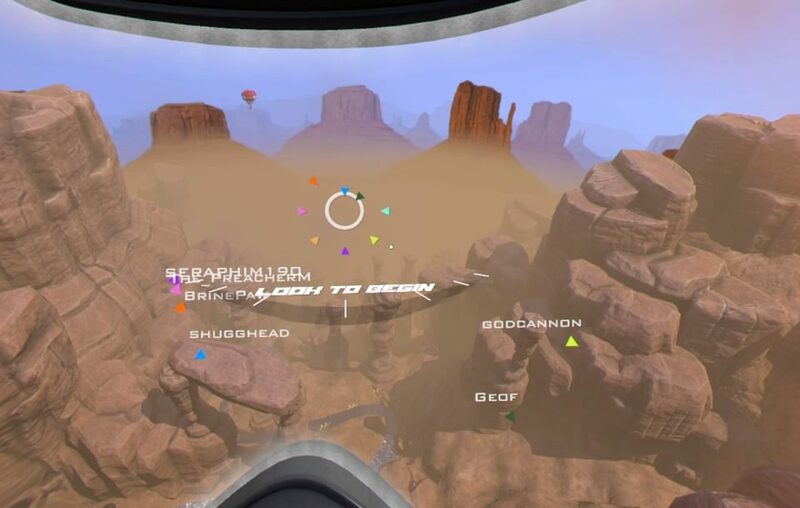 There are 3 modes of play available, Race, which is exactly as it sounds with you racing through 1 of 80 courses while flying through rings and getting those boosts. Should you miss a ring, 5 seconds will be added to your finish time, which is a death sentence during the campaign so don’t miss them. Time Attack is exactly that with you challenging top times and score attack challenges you to ride those edges for maximum points. All of these modes are available in single player or the oh-so glorious multiplayer which supports up to 11 players and is an absolute blast. 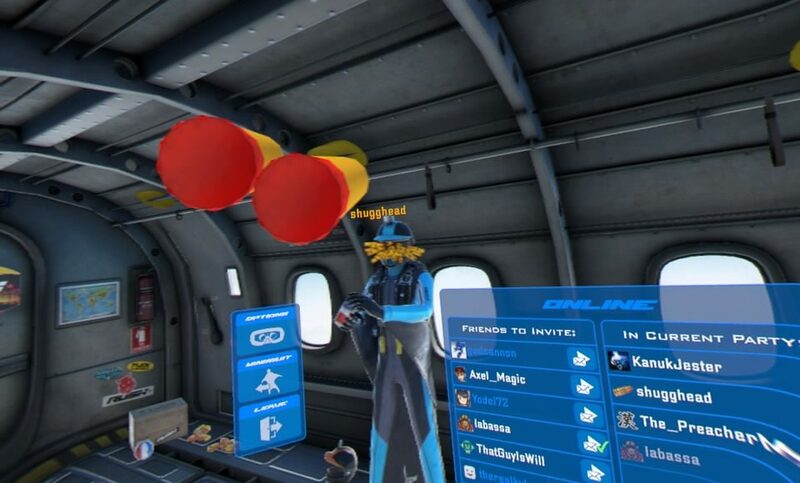 I can’t stress how much I had not only racing against my friends, but just messing around in the plane/waiting area in between races. The sandbox mode in this small little place is an absolute delight as you pop the caps on some canned drinks, mess around with dart guns or try and get a basketball in a hoop. You can perform a wide array of hand gestures which also makes for some comical moments and I guarantee if you play online, you’ll spend way more time in this area then you intended. Messing around in the hub area is great fun! So, like any pseudo-simulation the visuals need to be up to snuff lest immersion be ruined and thankfully, on the Rift or PSVR, the game looks pretty damn good. Rush is originally a Gear VR game which definitely worried me when it came to the graphics, but this game is loaded with a lot of ‘wow’ moments. The 4 stages all carry a very different look and while 1 or 2 looks better then the rest, they are all wonderful representations of their real-world counterparts. The opening stage, green mountain side probably looks the ‘worst’ out of the bunch, but even here there are some great moments, especially when the time of day changes or a storm rolls in. The weather and lighting effects in any of the levels give them a fresh coat of paint so even if you have played through a stage for the 15th time, you still might see something that you hadn’t before. Bottom line is for a wing-suit game, I am more then happy with the cliffs, tunnels and rock faces that look good enough to reach out and touch…but for the love of god, don’t do that, you’ll just crash. 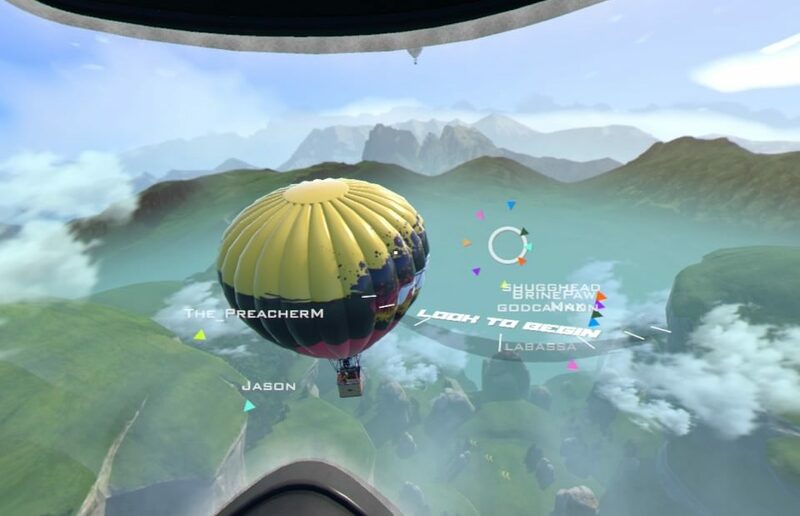 Heck, if you crash you end up in a base camp, which is live in the race, so you can see your fellow racers coming in for a landing, or if you have the skill, parachute into camp and give those losers a nice view of your oh-so sweet victory. The sound design is a little more wanting, but at the same time delivers what it needs to, to to get the job done. Each of the 4 courses delivers a singular track which is inoffensive enough, but also wears out its welcome after a handful of races, so you may end up turning that off. Thankfully, the 3D audio awesome and makes you feel the speed at which you are flying. Using you boosts increases that feeling and as you fly by waterfalls and cliff sides you can’t help but get a thrill as you narrowly avoid a crash, ending your race in an instant. A commentator gives you some generic quotes throughout a race depending upon your ranking though I also found here to get a little annoying after multiple plays. Either way, whether you play with everything or just the effects, when combined with the visuals, the audio, and presentation overall is enough to put in the game and experience what many of us may never try in real life. So, besides the minor audio and visual foibles I really can’t whine about to much else. Rush VR immediately brought me back to the days when I snowboarded down a mountain in the SSX series and is such a welcome addition to my VR library. When playing with 7 players online, we did run into a few hiccups with guys being randomly kicked from the game, but we still managed to play a bunch of rounds together and admittedly we played pre-release with guys all around the world, so the servers may not have been fully ready for us to test them like that. As I said the terrain does start to get a little repetitive, so I would suggest jumping back and forth between settings just to keep them feeling fresh a little longer. They are still huge areas with a ton of paths to play around in so one run may be completely different from the next. 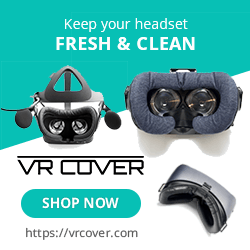 Rush VR is exactly what I needed from my VR headsets. There is more content here then I would have expected from such a small developer and they delivered big time of the wing-suit experience. Games like this are why we all bought into Virtual Reality and you owe it to yourself to give this a go. This is some of the most fun I have ever had in my almost 3 years of playing around with VR. What would I pay? Name a cost, I’ll pay it! In all seriousness the $30 price tag might seem a little steep to some but there is nothing else like this available on out headset that delivers such a fun and thrilling experience. I’m cool with $30. It’s loaded with content and a fully realized online mode that will keep me coming back unlike many other titles. The Binary Mill provided The VR Grid with a review code for this title and, regardless of this review, we thank them for that!